What are the benefits of placenta capsules? Scientific research shows that placenta contains iron, protein, B12, and hormones; all which can promote healing in a new mom’s postpartum body. Capsules boost energy, balance hormones, decrease baby blues, increase breast milk, and tonify uterus. Updated research on ingesting placenta capsules here. My placenta video answers this question more fully. Why use a PBi-Certified Encapsulator? Can a GBS+ mom use placenta capsules? It’s preferable to reserve your spot at least 1+ month before estimated due date by filling out intake form and paying deposit. You will receive a confirmation email and final invoice within 3 business days. The encapsulation is completed in your home after birth. I bring the necessary supplies and only need access to a sink, stove-top, electrical outlet, and bit of counter space. The entire process is completed in two steps and takes a total of 5-7 hours. The placenta is left to dehydrate for a period of time in between steps. Your kitchen is cleaned and sanitized after each step. You might think it awkward to have me in your home in the immediate postpartum. Though it may be a minor inconvenience, I am not there as a guest nor do I expect to meet mom or baby. I come and go quietly; leaving kitchen cleaner then I found it. You receive placenta capsules, tea/tincture, and dosage instructions. Placenta prints are an additional $25. How do I get placenta home from hospital? This is as simple as telling your doctor/midwife you want to keep your placenta to consume. You are NOT bringing it home to plant under a tree. Ask the hospital ahead of time if they have a protocol for releasing placenta (speak with someone in pathology or obstetrics). Some hospitals want to know in advance, others upon admission. Most VT/NH hospitals are familiar with my service and comfortable with moms bringing their placenta home for ingestion. 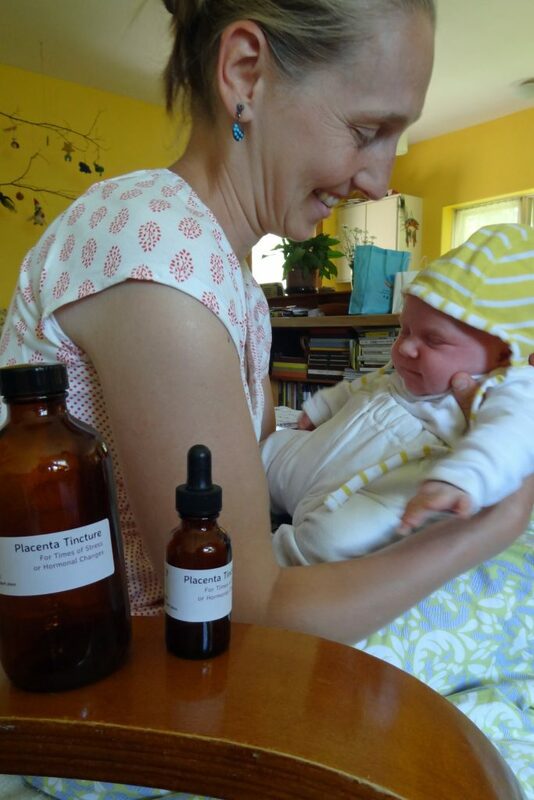 Many parents send the placenta back to their home fridge with a friend or family member. Sometimes dad likes to step out for a bit and bring it home. Once it is there (and depending on my availability) we will arrange a time for me to come encapsulate. I keep this part easy and go with what works best for all. You will receive a detailed checklist and informative letter to share with your care provider upon booking. Why do you encapsulate in my home? It is not legal for me to transport a placenta without proper certification and/or to encapsulate in our home. You can be certain you get your placenta and ONLY your placenta. (Center under fire for suspected practices). You know exactly what happens and that your placenta is stored at proper temperatures at all times. You can be assured your placenta is prepared in a clean environment. Without regular health inspections and monitoring, the only way to ensure capsules are prepared in a clean environment is to have them prepared in your home by a certified Specialist (us) specifically trained to handle blood properly. There are currently NO facilities in the United States that are approved for the preparation of placenta pills. It is perfectly legal to have your placenta prepared at your residence (or a friend/family). You only get one placenta when you have a baby. If it’s handled in an unsafe manner; over-processed; molds; ends up being someone else’s placenta; or causes sickness, you lose out on an opportunity to get the benefits of your placenta in your postpartum. What is your training and certifications? As a PBi-Certified Placenta Encapsulation Specialist, I trained with Placenta Benefits (leading resource in placenta encapsulation) to prepare placenta medicinally using a Traditional Chinese Medicine method on file with FDA. I maintain my certification as a ServSafe Food Handler and follow procedures used in food service establishments. My handling and disinfection practices meet strict Federal (OSHA/EPA) and local guidelines and PBi-standards meet the same EPA guidelines for licensed small laboratories, who handle blood-borne pathogens and medical waste. As a PBi-member, I have access to a comprehensive database on ALL things placenta to be able to answer any question that you (or your care provider) have. I operate with integrity, safety, and efficiency. If your home is properly ventilated, there is little to no smell. Otherwise, there may be a slight smell (described as cooked liver) in the kitchen area. Any smell dissipates quickly once encapsulation is complete. What if I have an epidural or c-section? Many moms I encapsulate for have epidurals or cesareans and 9 out of 10 times, the doctor releases the placenta without problem. These new moms benefit as much as those who had un-medicated ‘natural’ births. In some ways, even more, because placenta hormones act as a natural pain reliever to give mom relief during what is a sensitive, vulnerable time. I have moms take the capsules and tea and not need any other painkiller. Same goes for stitches or epidural after-effects. Updated research on placenta capsules here. According to Traditional Chinese Medicine (TCM), new moms are considered cold (yin) inside after releasing blood and baby (yang) during birth. One way to return heat (yang) and a flowing balance of energy is to consume “warm” food, such as cooked and/or warm food; including how a placenta is prepared for ingestion. The TCM method I use to prepare a placenta is one that has been used for centuries and involves a steaming process. I do not offer RAW encapsulation because this method has a cooling effect and can cause a new mom to feel ‘cold’ inside. Ingesting raw placenta is also not a good idea from a food safety perspective. What we want to do is warm the new mother. To contract, not expand. To calm, not stimulate. To ground her in body, mind, and spirit. Placenta capsules made with a TCM-method are warming to counteract cold and re-establish homeostasis, rebuild blood (chi), and regulate the endocrine functions (thyroid, adrenals) for good metabolism, sleep, and mood. The tea and tincture that I make also has a similar effect. This method lets you save remaining capsules for future use (i.e. menopause). Stored properly, capsules and the nutrients and hormones within will remain potent. Why are TCM capsules better than raw? I am trained to prepare capsules with a Traditional Chinese Medicine (TCM) method. This is a safe, potent way to ingest placenta capsules. The steaming process I use breaks down the cell walls of the placental tissue; allowing your body to easily access the vitamins, protein, and hormones stored there. Research shows the iron levels in a placenta doubles when prepared using a TCM-method. Placenta carries bacteria, viruses, and other blood borne pathogens. This is another reason not to ingest raw placenta capsules. The bacteria, and all that exist on and in the placenta and surrounding blood, are inherent in the body and vaginal canal, but once the placenta is born it is exposed to oxygen and the bacteria quickly take on life of their own. Downsides of raw capsules: Increase postnatal bleeding, decrease breast milk production, cool body, inhibit healing. For these reasons and more, I prepare capsules with a TCM method that is on file with the FDA. How many capsules do I get? What happens if baby comes earlier/later than “due date”? If you are more than 14 days overdue from EDD, or have your baby earlier then 14 days before, you are still a client and guaranteed service. There is simply a chance I may not be able to encapsulate within a 3 day period froom birth. If this occurs, you will receive instructions to freeze the placenta for a brief period of time. Frozen properly, the hormones and nutrients within the placental tissue remain intact. Will health insurance cover placenta encapsulation service? This is a question for your insurance company. Most do not. If you have history of PPD then you may have better luck. If you have a Flexible Spending Account (FSA) through insurance then this service might be covered. Are there contradictions to ingesting placenta? Placenta capsules made with TCM method have a warming nature that move blood and tonify reproductive organs. If a new mom has an existing “warm” condition (mastitis, flu, infection) the capsules can interfere with her body’s ability to cool down. This is why it’s recommended to stop taking capsules until symptoms of chills, fever, or aches are no longer present. Two main things that put mom at risk for taking capsules are 1) She regularly used tobacco during pregnancy; because heavy metals, like cadmium, can remain in the placenta tissue. 2) She develops a fever during labor, or time of birth, due to an amniotic infection (chorioamnionitis). Both these situations make placenta questionable to ingest. Other contraindications to placenta encapsulation are: Hepatitis, HIV, or other uterine infection. Special circumstances that are not contraindications to placenta encapsulation are: Sexually Transmitted Infections (i.e. HSV, HPV, Chlamydia, Gonorrhea), meconium staining, GBS+, Gestational Diabetes, HELLP, PUPPS (some moms wait few weeks before starting capsules), use of antibiotics during labor, cesarean, epidurals, spinal anesthesia, IV medication (i.e. Nubain, Pitocin, Mag Sulfate). Having an epidural, induction, or cesarean birth does not typically interfere with the TCM encapsulation process. Please contact Tara if you have more questions about this. My placenta is in the freezer … can I still encapsulate? Please see pricing page. Scholarships and barters are available to those that qualify. Discounts to teen moms. Like my FaceBook page for occasional specials. In case you are unable to obtain placenta due to high fever/infection during birth, then you will be refunded all but the non-refundable deposit fee of $50. Refund processed within 2 weeks of request. If you’d like to purchase a gift certificate for an expectant mom, contact Tara. This is a lovely baby shower gift. Due to the nature of this business, no surprise gifts please! If you are a friend/family member and would like to contribute a payment towards a current balance, we can do that too. Disclaimer: Benefits of placenta encapsulation are supported by ongoing research. However, statements here are not evaluated by the FDA and my service is not intended to diagnose, treat, cure, or prevent disease. Please make any decisions to consume your placenta with your care provider. I am not a medical doctor, holistic practitioner, or herbalist. Those utilizing this service take full responsibility for using their placenta capsules, tea, and tincture at their own risk.